We live in the 21st century, a techno world, a progressive economy world, the world which is offering us a plethora of choices to live with. We all know some of the choices require a little thought or reflection—like the choice of what to eat for breakfast — while others, demand rigorous deliberations like choosing ones’ career. The question here is, do we really think career decision is a serious decision and requires deep reflection? Unlikely!!! Who am I? What am I interested in? What am I good at? What is important to me? The answers to these questions are pieces to a larger puzzle, i.e., "What do I want to do with my life?" Where do I fit in?? You must know that choices are rarely ever made in wholly black or wholly white, all good or all bad, clearly right or clearly wrong. Choices are actually quite complicated and multi-dimensional; prisms through which no two people will see the same world. In that case, we must make predictions and assumptions and, at times, take great leaps of faith. There is no guarantee, of course. Even the most thoughtful decisions have been known to backfire. A choice is, most often, nothing more than a best guess—a hopeful step in a new direction. 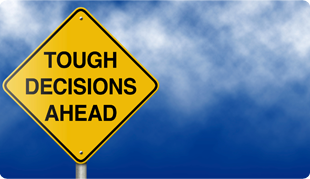 So, when faced with a career choice dilemma, whether big or small, how can you make sure you’re approaching the situation with the appropriate level of consideration? How can you ensure that your guess is truly the best that you can do? Below are a few points to remember in your decision-making process. Making an intuitive decision: "It feels right." Making an impulsive decision: "Decide now; think later." Don't look before you leap. Making fatalistic Decision: "Whatever will be will be? I will not get anything which is not in my luck." Play-it-Safe Decision: "I like human biology, but I can get a job in IT easily." Every choice shapes your reality and is a reflection of who you are, what you value and what you want. It is unrealistic, and unhealthy, to suppress emotions completely, it’s helpful to understand how they influence your behaviours. Do not take career decision solely makes the adults around you happier. Anxiety and urgency almost always have a negative impact on decision-making. Don’t let a ticking clock push you into a choice that you haven’t properly evaluated. There are always more options. When you trap yourself in limited thinking, you fail to see the real opportunities. Don’t place artificial restrictions on yourself or on the possibilities the world has to offer. Build trust: Trust in yourself, trust in others, trust in the Universe. Have a little faith that everything will work out well, whether or not the future looks exactly the way you had imagined it. Remember that change is constant and you have the resources to manage whatever comes along. Your choices have consequences that shape your reality; you always have the opportunity to make different choices in the future and create a new reality for yourself. Be a Planner: Tell yourself that your strategy is based on a rational approach with some balance between the cognitive and emotional: "I am the captain of my fate; I am the master of my soul. Remember that a well thought-out choice is never wrong, no matter what happens. It might be tempting to blame yourself when things don’t turn out the way that you had anticipated, but this accomplishes nothing. Don’t dwell in regret. Simply accept the lesson and move on. Take what you’ve learned with you and use it the next time whenever you face a difficult choice in your career or elsewhere in life. This is the most important step in stream/career choice decision making. Know your Personality, the personal quality that would influence your career progress. Gather more and more information about careers, speak the people who are working in that particular career.